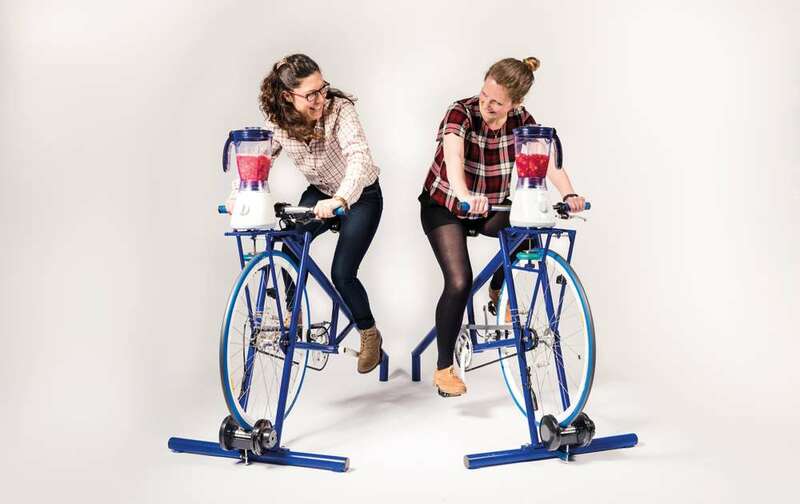 Smoothie Bike Challenges are a fantastic way to generate interaction and engagement at events or work places. The competitive nature of the challenges create a lively atmosphere as employees spectate and support their colleagues as they compete against each other! Outcome: Competition, fun and positivity amongst staff = boosts morale; happier and healthy workforce. Race Participants race against the clock to achieve the best time or race side by side to a virtual finish line! Smoothie Powering up the pedals creates a delicious smoothie for the competitor to drink at the end of each challenge. Medals Distances and times are recorded throughout the day. Smoothie Bike Challenge Medals are awarded to the winners! 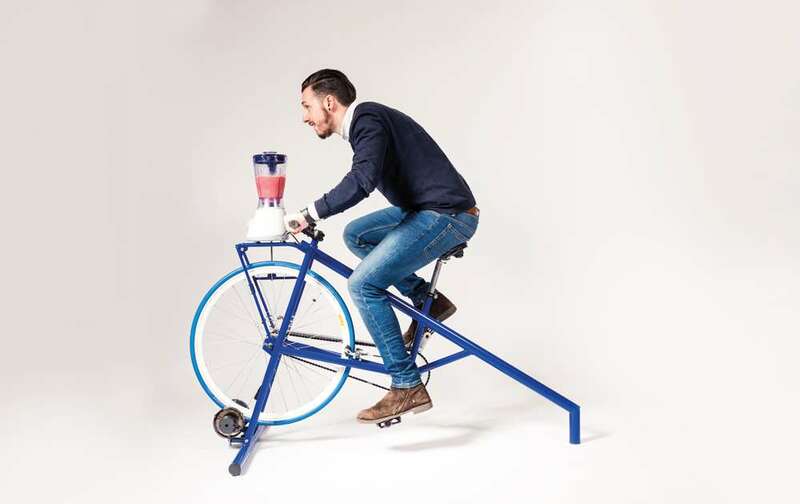 A Smoothie Bike is a static bike that links directly to a handlebar mounted smoothie blender. 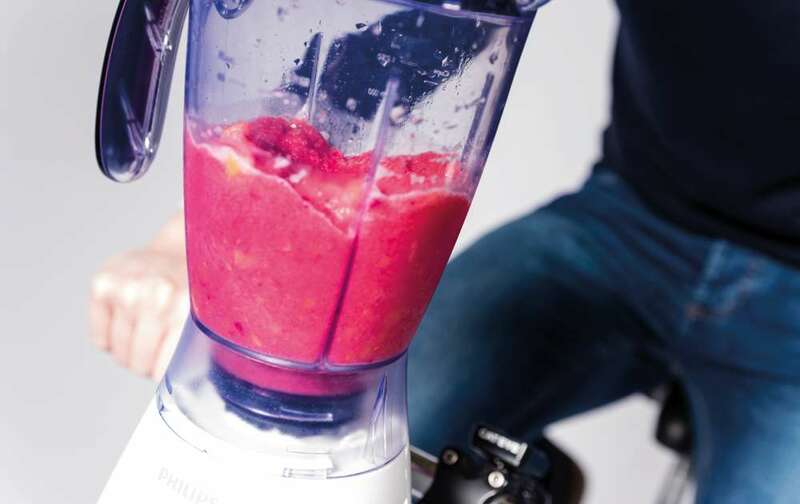 With each pedal stroke the rider creates their own fresh smoothie to take away with them. Riders can race each other side by side over a distance or for a set amount time, with the winners in both male and female categories getting a medal at the end of the event. This is a head to head race with two Smoothie Bikes. This Challenge uses software to allow riders to race over a set distance which can be viewed on a large electronic display – the riders’ progress appears live side by side on the screen during the race, and the winner is clearly displayed at the end. The times are stored in the system and a live leaderboard is displayed all day, so riders can keep tabs on their position throughout the event. Great fun, generating a good atmosphere and great spirit amongst employees! Encourages riders to race the furthest distance they can in a set time limit. One or two bikes can be used in this challenge as the rider is racing against the clock to get the best time to beat their colleagues! These distances are recorded on the large magnetic ‘Top Gear style’ leaderboard so everyone can see who is winning and the distance to beat! Depending on which challenge you have chosen will depend on the size of area required. A 3m x 3m area is required for the Race Challenge and a 2m x 2m area is required for the Distance Challenge. For the Race Challenge a power source is required. The Smoothie Bikes can be located inside or outside – if situated outside, a Gazebo is provided for protection against the weather. Competitive challenges and engagement creates positivity amongst staff which boosts morale and helps towards a happier and healthy workforce. “Wanted to let you and the rest of the staff at Wellbeing People know that our students thoroughly enjoyed the two days’ events. They were a hit! 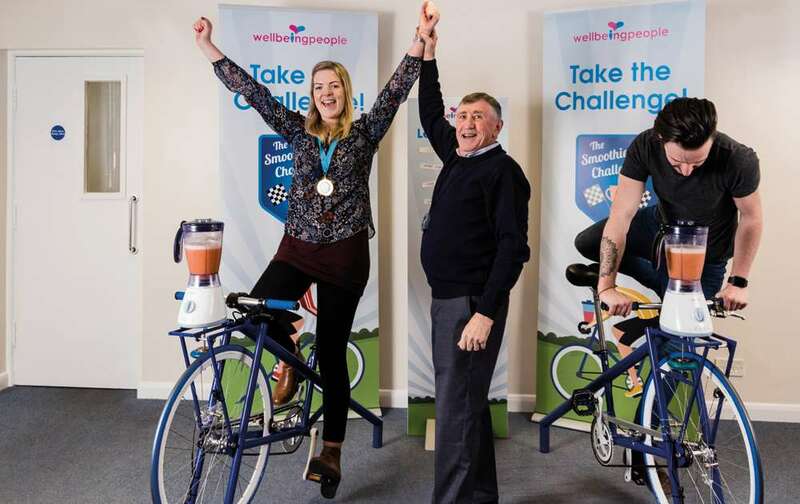 Also wanted to mention how lovely it was to have Allan on campus on the day we featured the Smoothie Bikes. The students adored him, as did the staff. By the end of the day, he knew many of the students’ names, and I’m sure many of them will remember his. He facilitated the perfect atmospheric balance of competitiveness and fun. What a great guy!